The question of how novice financial brokers, actively developing their activities in the world financial markets, without fear of competition from the “old-timers”, confounds not only amateur traders, but also professionals who devoted this activity almost all their lives. Indeed, where do the daredevils who are able to invest not only personal savings, but also other people’s financial resources, with the purpose of creating and developing a new trading platform? At the same time, many of them are not afraid of such factors as lack of necessary experience, ignorance of all the nuances of the functioning of international economic systems, a huge number of legislative restrictions, etc. On the other hand, a well-known economist said that if all the beginning entrepreneurs were afraid to deal with a new business, believing that they were not capable of defeating their competitors, we would gradually become a country resembling the USSR or Cuba. Therefore, the creation in 2017 of the new financial broker Optionfield is quite natural phenomenon (even taking into account the “terrible” forecasts about the future of the world economic crisis). And this issue is of great interest to everyone who makes a living by doing online trading. The first factor that causes displeasure of domestic traders who decided to study in detail the presented trading platform is the lack of a Russian-language version of the web resource of this company. And the application, prepared by the best programmers of the Optionfield site (allows you to work using modern means of mobile communication), and the worldwide popular MT4 platform, which perfectly copes with its direct functional duties, of course, ensure an impeccable operation of the web resource, but the beginning trader to understand all the subtleties of this program is almost impossible if he does not know English, German, Portuguese, Spanish, Chinese or Vietnamese. It is much easier for our compatriots who know the main principles of the work of companies providing Internet-trade services. Before registering for the Optionfield login, every experienced trader will necessarily check all legal aspects of the company. And in this case, do not even have to be a professional to not pay attention to the fact that Optionfield was created and successfully survived the hardest time for most brokers of binary options, accompanied by massive bankruptcies and bans of activities of such firms in many countries of the world at the legislative level. Not the least role in this situation was played by the professionalism and rich experience of the company’s founders who knew well how the Forex market works and the Binary Options brokers. Having received the prestigious award Rising Star 2018 from FinancesOnline and having built the company’s work in such a way that every new trader opened a trading account in 80-90% became a regular customer of Optionfield, the resource creators very quickly gained popularity, often outstripping more experienced competitors. ● Protection of personal information and financial means of users. ● The most convenient system of work for clients. ● Honest and trustful relationship between the resource administration and its users. ● An effective partnership program. ● A high percentage of payments – about 85% (one of the leaders among young brokers). The only drawback of the company in question, in terms of security – is the lack of a regulatory body. Despite the fact that the broker is registered on Fr. Cyprus, the owners of the resource came to the conclusion that the cost of obtaining a license, in this case, will not add to the broker an additional reputation. Despite the fact that the company only recently “forcibly” international financial markets, in terms of the level of development and introduction of new methods for making profits, it can be safely added to the list of some of the most promising brokers. Every prospective novice or even an experienced trader can count on help from the help desk around the clock. To do this, you can contact the experts of the web resource with help, site, email or traditional telephone communication. 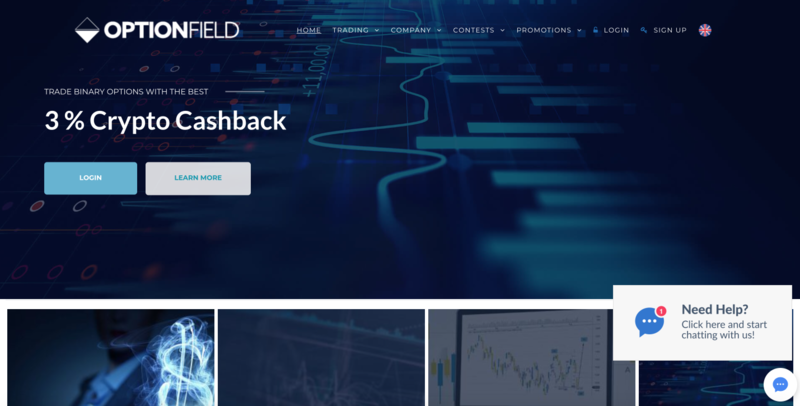 Note that to gain practical experience, a future trader can use the Optionfield demo account, which allows you to study all the nuances of working on a web resource without risking your own savings. Unfortunately, the network refers to the period when they were just starting to write about Optionfield reviews, there was little precise information about how much the novice trader should have to have this kind of activity bring him a more or less decent income. 1. Classic account. It is necessary to pay from $ 100. The main task is to learn how to work on this resource. 2. Account Pro opens from 2 thousand dollars, and also allows you to bet from 5 $. 3. Elite. To open an account, the trader must be from 100 thousand dollars. This account gives a lot of opportunities, but it is of interest only for experienced traders who have the appropriate capital. ● A bonus of 100% of the deposited deposit is provided, in some situations, users receive to their trading account 3-5 times more from the original amount. And the final question of the presented review: what traders of the prospective project can use as financial instruments. At the moment, binary options are the key commodity of the resource under consideration, but no economist will venture to risk the binary options in just two or three months. Hi, everyone. Just to let you know that our free October monthly Binary Options MT4 demo contest has just started. The winner takes an award of 1000 USD. Expert Advisers (automated trading) are welcome. You can find more information here URL: optionfield.com/company-blog…-october-2018/ and can check out the current ranking here URL://optionfield.com/demo-contests/eternal/. If you have any questions, you can reply here or contact our Support. Hi, guys. We hope you are doing well. Just a quick update on what’s ongoing currently at Optionfield. This month we are having a free Binary Options Demo contest with a prize pool of 2000 USD to be split among the first 3 winners. We are also running a 5% profit boost program which gives you 5% trading rebates on all your April winning trades. For more information, please visit our website or contact our Support team.